Currently, 38 countries participate in the VWP: Andorra, Australia, Austria, Belgium, Brunei, Czech Republic, Chile, Denmark, Estonia, Finland, France, Germany, Greece, Hungary, Iceland, Ireland, Italy, Japan, Latvia, Liechtenstein, Lithuania, Luxembourg, Malta, Monaco, the Netherlands, New Zealand, Norway, Portugal, San Marino, Singapore, Slovenia, Slovakia, South Korea, Spain, Sweden, Switzerland, Taiwan and the United Kingdom*. Eligible nationals of all member countries must obtain an ESTA prior to travel to the United States. They must also have a passport that meets the requirements outlined here. * Only United Kingdom passports notated with “British Citizens” and/or “with unrestricted right of abode in the United Kingdom” are eligible for VWP admission. Holders of passports indicating that the bearer is a British Subject, British Dependent Territories Citizen, British Overseas National or British National (Overseas) do not qualify for the VWP. What are the other requirements of the Visa Waiver Program? Citizens of the above countries may use the Visa Waiver Program under the following conditions. Traveling for business meetings or pleasure (not on federal government business or as members of the media). Transit through the United States is generally permitted, if the total time in the U.S., Canada, Mexico, and adjacent islands is less than 90 days. Staying in the U.S. for less than 90 days (this includes time spent in Canada, Mexico, and adjacent islands). Traveling on an unexpired machine-readable passport (MRP). Depending on when VWP travelers’ passports were issued, other passport requirements will apply. MRP issued before 26 October 2005 – no further requirements. MRP issued between 26 October 2005 and 25 October 2006 – digitized photograph on data page or integrated chip with information from the data page. They have complied with the conditions of previous admissions under the VWP, and have not been found ineligible for a U.S. visa. If arriving by air or sea, they are traveling on an approved commercial carrier and have a return trip ticket to a foreign destination other than the U.S. or adjacent islands. If arriving by land, they can demonstrate the intent to stay 90 days or less in the U.S. and sufficient funds to support themselves in the U.S.
VWP travelers who have been admitted under the Visa Waiver Program and who make a short trip to Canada, Mexico or an adjacent island generally can be readmitted to the U.S. under the VWP for the original admission period. They do not have a criminal record. How do I enter the United States using the VWP? You must be a national of a participating country and satisfy the eligibility requirements as listed above (please see “What are the other requirements of the Visa Waiver Program?”). If entering the U.S. by sea or air, you must travel on a signatory carrier. The VWP permits arrivals from Mexico and Canada at land border ports-of-entry. The documentary requirements are the same, except there is no requirement for round-trip tickets and signatory carriers, as there are no carriers involved. You must satisfy the inspecting officer that you have sufficient funds to support yourself during your stay and to depart the United States. If you enter at a land port-of-entry you must complete and sign the Form I-94W, Nonimmigrant Visa Waiver Arrival/Departure Form and pay the land border fee (currently USD 6.00) and you must be admissible to the United States as a nonimmigrant. Please note, ESTA approval may not be required when arriving by land into the United States. This is ultimately at the discretion of the Customs and Border Protection officer at the port of entry. What is a “Signatory Carrier”? To meet the requirements of the VWP when arriving to the U.S. by air or sea, you must travel via a “signatory carrier” which has signed an agreement guaranteeing to transport you out of the United States if you are found to be inadmissible or deportable. Most commercial carriers that fly from Australia to the U.S. are signatory carriers. Please see here for a full list of signatory carriers. I forgot to hand in my departure record (form I-94W) when I departed the United States. What should I do with it? Click here for Instructions for Returning your I-94. For more information see the U.S. Customs and Border Protection website. Instructions for Returning your I-94. If your I-94 (white) or I-94W (green) Departure Record was not removed when you departed the United States, it is possible your departure was not recorded properly. ship No further action necessary. What documentation should I include if returning my Departure Record by mail? Dated bank records showing transactions outside of the U.S.
An explanation letter in English. Mail legible copies. CBP cannot return original materials after processing. What else do I have to do when I depart from the United States? Generally the U.S. does not have mandatory exit controls. However the Bureau of Customs and Border Protection is currently testing US-VISIT exit procedures at 12 major airports and three seaports. If you leave from one of these ports, you are required to confirm your departure. Your check out will include the scanning of your visa or passport and repeating the simple inkless fingers canning process for first your left index finger and then your right index finger. A workstation attendant will be available if you need assistance. The exit confirmation will be added to your travel records to demonstrate compliance with the terms of your admission. Ultimately, most foreign visitors will be required to check out before leaving the United States. For more information on which ports are currently involved in this program, please see the Department of Homeland Security’s website. You cannot extend the time on the Visa Waiver Program. The 90 days also includes any time spent in Canada, Mexico and adjacent Islands. Therefore, you cannot cross the border into these areas and then return for another 90 days. You can however ask for re-entry on the Visa Waiver Program if you have left the continent. I am transiting through the U.S. on my way to another country. Can I use VWP? Yes, as long as your total stay in the U.S., Canada, Mexico and adjacent islands is less than 90 days, and you meet the other VWP requirements. You can use the VWP if, for instance, you are transiting the U.S. on a journey between New Zealand and Europe. However, if for example you are transiting the U.S. on the way to a six-month stay in Canada, you cannot use the VWP, as your total time in the U.S., Canada, Mexico and the adjacent islands will be over 90 days. In this case you should apply for a B-1/B-2 visitor visa, or a transit visa. Can I visit Guam on the Visa Waiver Program? do not apply for an extension of stay, adjustment of status or change of nonimmigrant status. The following countries are eligible for the Guam-CNMI VWP: Australia, Brunei, Hong Kong*, Japan, Malaysia, Nauru, New Zealand, Papua New Guinea, the Republic of Korea, Russia, Singapore, Taiwan and the United Kingdom. *Citizens of Hong Kong now require a Hong Kong Special Administrative Region passport and Hong Kong identification for admission. The following countries are no longer eligible for the Guam-CNMI VWP: Indonesia, Solomon Islands, Vanuatu and Western Samoa. Visitors who are not eligible for either the VWP or the Guam-CNMI VWP must possess a valid passport and U.S. visa. For further information please see the Guam tourism site. Am I allowed to visit the United States after I've been to Cuba? Entry (even with a valid visa) is determined by U.S. Immigration officials at the port of entry. You may wish to take supporting documents about the purpose of your trip. Can I visit Micronesia on the Visa Waiver Program? The U.S. government is no longer responsible for immigration matters in the Federated States of Micronesia (FSM), but as a guide, New Zealand citizens are generally admitted visa-free for a stay of 30 days. Upon arrival, visitors must present a completed FSM Immigration Arrival and Departure Record which is given out by the carrier prior to arrival. Travelers wishing to stay in Micronesia longer than 30 days must also complete an entry permit. Visitors must demonstrate the ability to travel onwards from the FSM and to leave the FSM at the end of the visit. Please see the visit FSM website for further information. When does a national of a VWP country need a visa instead of using VWP? has a communicable disease or other condition making them ineligible for a visa. What is a machine-readable passport? What is an e-passport (or biometric passport)? A machine-readable passport has certain biographical data entered on the data page in accordance with international standards. A key feature is the two lines of printed machine-readable data that appear at the bottom of the page. New Zealand passports issued in New Zealand from 2006 onwards comply with requirements for biometric passports. Travelers should contact their country’s passport issuing agency or authority if they have any doubts related to whether their passport is machine-readable. Useful information about passports from particular countries, including temporary passports, can also be found on the Department of State’s webpage on VWP. Are all VWP countries now issuing e-passports to their citizens? The vast majority are and many have been for some time. However, a few countries offer their citizens a choice of either an e-passport or a traditional passport, if they are still in production. My children are included in my machine-readable passport. Can I use the VWP? Families seeking to enter the U.S. under the VWP need to obtain an individual MRP for each traveler, including infants, as machine-readable passports typically have biographic data for only one traveler in the machine-readable zone. Children included in family or parents’ passports may be denied visa-free entry into the U.S. since only the primary traveler’s biographic data is included in the passport’s machine-readable zone. I am not sure if the purpose of my trip falls under the VWP. If in doubt, travelers should check with the nearest Embassy or Consulate to verify that what they plan to do is considered tourism or business. I am going to the U.S. on an exchange visitor (J) visa. Can I transfer to the VWP without leaving the U.S. when my J visa expires, so I can travel around the country? No, you cannot change to the VWP from any other visa category while you are in the U.S. You can only be admitted to the VWP on arrival in the U.S.
Is there a limit to how many times I can enter the U.S. on the VWP? Must there be a minimum period between one period of travel on the VWP and the next? No, but entry or re-entry into the United States is at the discretion of immigration officials at the port of entry. VWP travelers who have been admitted to the U.S. under the Visa Waiver Program and who make a short trip to Canada, Mexico or an adjacent island generally can be readmitted to the U.S. under the VWP for the original admission period. They do not, however, get a new 90-day admission period. I am a journalist traveling to the U.S. for work. Can I travel under VWP? Foreign media representatives planning to engage in that vocation in the U.S. are not eligible, as the purpose for their stay does not qualify as “business”. These professionals must obtain a nonimmigrant media (I) visa. Does my passport need to be valid for more than six months to use the VWP? New Zealand passports are exempt from this rule (so are Australian and British passports, among others). See the State Department’s webpage on the VWP for the full list. I was arrested/convicted of a crime years ago. Can I use the VWP? ESTA will assess your eligibility for travel to the United States under the Visa Waiver Program. The assessment includes questions regarding previous arrests and/or convictions. If you have been arrested for or charged with a crime, including offences involving the use of a controlled substance, you may require a U.S. visa and, in some cases, a waiver of ineligibility. If you choose to apply for electronic travel authorization via ESTA, the system will advise you whether you must visit the U.S. Consulate in Auckland to apply for a visa. For further details on ESTA and to see if you are eligible for the VWP please refer to the ESTA website. I had a drink driving charge. Do I need a visa? ESTA will assess your eligibility for travel to the United States under the Visa Waiver Program. The assessment includes questions regarding previous arrests and/or convictions. However, a conviction for driving under the Influence is not considered a crime of moral turpitude with regard to the Visa Waiver Program. If you choose to apply for electronic travel authorization via ESTA, the system will advise you whether you must visit the U.S. Consulate in Auckland to apply for a visa. For further details on ESTA and to see if you are eligible for the VWP please refer to the ESTA website. I am HIV positive. Do I need a visa to travel to the United States? The Department of Health and Human Services, Centers for Disease Control and Prevention (HHS/CDC), published a Final Rule in the Federal Register to remove HIV infection from the list of communicable diseases of public health significance. It went into effect on January 4, 2010. This means that HIV positive status is no longer considered to be an ineligibility for travel on the Visa Waiver Program. For further information please see the Federal Register release. Electronic System for Travel Authorization (ESTA) became mandatory on January 12, 2009. It requires VWP travelers to provide basic biographic, travel, and eligibility information online to receive advance authorization prior to their departure for the United States. Most travelers can expect to receive authorization within a few minutes; however, travelers are advised to complete an ESTA as soon as they begin to plan their travel, and at least 72 hours in advance to avoid any last-minute delays. The system does not affect travelers who have obtained a valid visa from a U.S. Embassy or Consulate overseas. Review the ESTA Help Menu for general information. Choose the Help Question Icon beside each question. Additional Help for Questions A-G is provided for some of the “Do any of the following apply to you?” questions where the meanings are less clear. More information about the Visa Waiver Program is available from the State Department website and the Customs and Border Protection website. Please see here for general advice on visas. Qualify for a Visa Waiver? All nationals and citizens of Visa Waiver Program (VWP) countries, including New Zealand, are required to obtain a travel authorization prior to initiating travel to the United States. This requirement commenced January 12, 2009. Authorization may be obtained online through the Electronic System for Travel Authorization (ESTA), an internet application administered by the Department of Homeland Security. 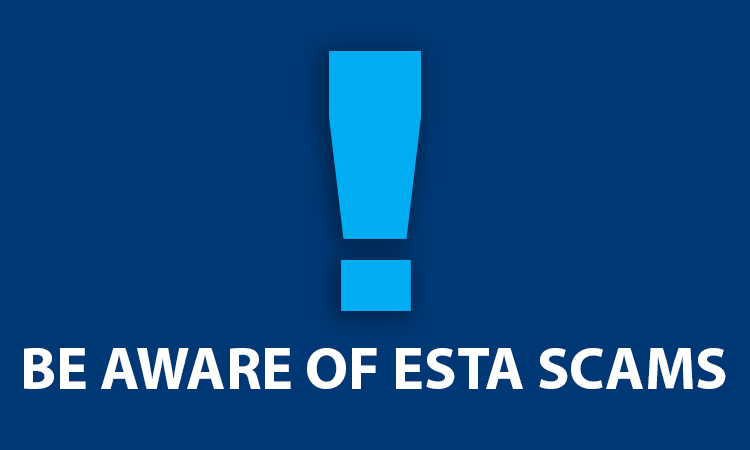 As of September 9, 2010, a fee of $14USD will be charged to submit an ESTA application. VWP travelers should be aware that unauthorized third-parties have established websites, which charge visitors an additional or higher fee for information and for submitting ESTA applications. These websites are not endorsed by, associated with, nor affiliated in any way with the U.S. government. VWP visitors should apply now for the travel authorization.